Auriculotherapy is a health care procedure in which stimulation of the auricle of the external ear is utilized to alleviate health conditions in other parts of the body. While the original basis of Auriculotherapy is in ancient Chinese acupuncture, the late Dr. Paul Nogier, a French Neurologist developed the current methods in France utilizing painless stimulation without acupuncture needles. In the 1950’s he began to notice that several of his patients had an unusual scar on a specific area of the ear. 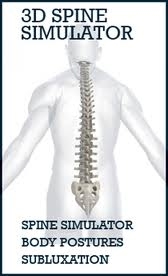 His patients informed him that the scar was a treatment of sciatica, which had given them relief within hours or minutes of treatment. After studying this phenomena, and doing research, he began mapping other parts of the body. This research lead to the inverted fetus principle. This was the basis for his diligent work to advance this technique to what we know today. Auriculotherapy is needle-less stimulation of the external ear for alleviating pain and dysfunction in other parts of the body. Auriculotherapy uses electricity to diagnose and treat auricular acupoints (acupuncture points on the ear). The external part of The ear is considered a “Microsystem” of the body. Microsystems are like small images of the whole body, located in different locations on the body and in this case, the ear. The ear is a complete Microsystem of the human body. All parts of the body are represented in an inverted pattern on the ear. There are other Microsystems in the body but the ear has been shown through research to be the most effective Microsystem. This is due to the type of tissue that makes up the ear and due to its direct connection to the nervous system, which controls every single cell and bodily function. Auriculotherapy works by stimulating the central nervous system through the cranial nerves and spinal nerves on the auricle (external ear). This stimulation results in neurotransmitters being stimulated within the brain and spinal cord of the central nervous system. This stimulation of neurotransmitters modulates the pain and modulates nerve function beginning the healing process within the body to that organ or body part that is affected. Auriculotherapy is performed by the doctor using electricity (micro-current) as a means to diagnose and treat auricular acupoints. There are over 200 auricular acupoints on each ear that represent all parts of the body and many functional areas of the body. The doctor uses a small hand held wand that has two functions, it diagnoses by measuring the differences in skin conductivity in relation to the acupoint, and is also used to treat the acupoint. The wand measures the positive and negative polarity (differential) of acupoint and surrounding tissue. When there is a large difference in polarity, either positive or negative, it is indicative of the presence of an injury, pathology or disease in that part of the body that corresponds to the acupoint. If the point is extremely negative or extremely positive, the machine will automatically stimulate the ear point with electrical stimulation positively or negatively as needed. This is all done with the touch of a button on the wand. The machine, which is called a Stim-Flex 400A is the most advanced equipment in the field and allows the doctor to diagnose pain, dysfunction, and disease whether it be somatic, visceral or psychological in origin. For most, the procedure is painless. You may feel a tiny sensation in the ear where the point is being treated. This is usually for a second or two and then the sensation goes away. If it feels slightly uncomfortable we can decrease the intensity to where you do not feel it. Most of the time this isn’t necessary as the treatment is tolerable. What conditions does Auriculotherapy help? Auriculotherapy is good for acute painful problems alleviating pain almost immediately or within 24 to 48 hours. Auriculotherapy is good for chronic degenerative conditions such as osteoarthritis, rheumatoid arthritis, fibromyalgia and other chronic painful conditions. Other conditions include diseases and dysfunctions of the gastrointestinal, respiratory, urinary and cardiovascular systems. Auriculotherapy is very effective for treating addictions. In fact, Auriculotherapy has a seventy five to eighty percent success rate treating patients for smoking or nicotine addiction. There are currently more than 150 indications for the application of Auriculotherapy. Just ask Dr. Peck if Auriculotherapy is right for you. Most chronic conditions may be treated once or twice to three times per week. However, in some acute conditions and very serious conditions, Auriculotherapy may be applied daily for approximately one week to 10 days. Usually with smoking addictions, all that is needed is one or two treatments to break the physical addiction to nicotine. The primary side effect of ear acupuncture or Auriculotherapy is tenderness or inflammation to the ear itself. This is usually very rare. Auriculotherapy and acupuncture generally have almost no side effects, especially if the doctor is using Auriculotherapy with electrical stimulation, which is how Dr. Peck performs Auriculotherapy. 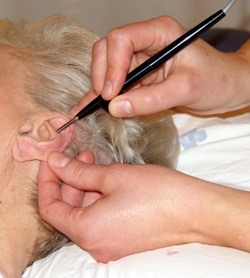 Infection is possible when the skin is pierced with the acupuncture needle, but is never heard of in Auriculotherapy. If the patient is afraid of needles, Auriculotherapy is a painless alternative to ear acupuncture. If the doctor is using the Electro-Therapy Association's guidelines for treatment, there are virtually no negative side effects. Dr. Peck is certified in acupuncture and is trained in Auriculotherapy through the Electro-therapy Association and uses their guidelines for treatment. Dr. Peck is proud to be the first doctor in St. Clair County to offer needle-less Auriculotherapy using the Stim-Flex 400A. Auriculotherapy is contraindicated in patients that are in their first trimester of pregnancy and for those patients who have certain types of pacemakers or defibrillator's.